Here is a copy of a post I put up just before the 1st anniversary of Katrina. It’s hard to believe that we’re coming up on 3 years. Wow. Three years since the world got tossed, turned, washed, and wasted. Since it’s that time again I thought I would start it off with a visit to past impressions. A friend of mine put up an article on her blog Crabby’s Kitchen, about her first impressions on coming home after Katrina. That made me think that maybe I would put up the following notes. This was something I wrote only a few months after moving away from Mississippi. It’s just some thoughts and experiences I had as Katrina started coming our way. Anyhow, here it is. My family and I ended up riding out Hurricane Katrina at Stennis Space Center in Mississippi. The eye of the storm went right over us. The family actually went out and stood in the eye of the worst disaster to ever hit our county. We rode it out, and we survived the worst that the bloody thing could throw at us. At the time we had no idea of the damage that was happening around us. We were lucky. To tell the truth we were very, very lucky, and at the time had no idea of just how lucky. Our house survived with only minor damage. Our family made it through the storm alive, heck, even the dog and cat survived. We were lucky. There were so many around us that weren’t. My wife, three daughters (twin 6 year olds and a 10 year old) and I all lived in Diamondhead Mississippi. We were there 1 year and 1 day before Katrina came and said hello. I worked for IBM at the Naval Oceanographic Office, NAVO, which is located on Stennis Space Center, MS. Which also happened to end up as FEMA’s command and control center after the storm. We watched the storm coming our way with the same disregard/worry that we did all the other storms that year. They always seemed to miss us or weaken to the point of not being a danger just before landfall. Thus we didn’t evacuate. That and we were between paychecks and light on money. Heck, to tell it like it was, we were broke. The closest family was in Montana, not really an option. So we waited and watched and worried. On Sunday morning things were looking pretty grim. Lucky for us NAVO was considered a refuge of last resort for staff and family. That and I was the only IBM specialist to stick around, I’m something of a supercomputing specialist. As such, as soon as I walked in the door with my family I was considered part of the ride out crew, and thus considered essential personnel. (NAVO is a very large computer center for Navy research.) We had a safe place to stay only a short distance from home. Not only were we allowed in, I was immediately put to work. We started opening offices up, conference rooms, hallways. Putting people in every nook and cranny available. Not even the stairwells were safe from being used. There were children of all ages, elderly, wives, husbands, you name it. We made beds out of blankets, air mattresses, whatever. We all, and I mean all, believed that we would be there for the night and maybe for part of the next day. It looked rough. But, so did Ivan, Dennis, Cindy, and several other storms before this. Across the street the NASA building was filling up with staff, family, and people from the surrounding area. That building was about 3 times the size of ours with the cafeteria in it. Since our building was a Navy building with some extremely large computer systems in it, we had tighter security and thus we only had staff, family of staff, and Navy personnel, and still we were tight on room. The day wore on, the winds kept picking up. News from southern Louisiana was bad. The day wore on. Things started to get tense. I took my laptop, a monitor, some chairs, some boxes, speakers stolen from my friend Pat’s desk, and set up the first and only “Stennis Theater” at the end of a hallway for the kids. We had tons of DVD’s. Movie after movie was played to keep the kids entertained. We had popcorn and snacks for the kids. As the night progressed the winds kept getting stronger and stronger. Some slept. Others tossed and turned. Some spent the whole night in front of the small tv that had been set up in the hallway. Watching and waiting. I was lucky, I was busy. I had things to take my mind off what was happening outside, but even I kept stopping and would stare at the tv. Waiting, wondering, not really believing. Not many people slept that night, as the winds slowly built up. It was a long night. For the rest of my life I will remember the quiet of the hallways. People laying in the semi dark. The flickering of the TV down at the end of the hall. The quiet whispers. The way everything was hushed, tense, with an underlying layer of scared. The way people would look to me because I was busy, had a badge, kept meeting with the powers that be, and acted like I knew what the hell I was up to. People kept asking me what was up, what did I know, what had I heard. Even though, just like everyone else, I had no idea, no concept of what was, and about to happen to the world around us. Later, this would haunt my dreams. Can you feel it? Can you possibly imagine what that’s like? The nervous anticipation, the dark crowded hallways, the news showing us the wrath of mother nature headed our way. Knowing that it’s headed straight for you and you can do nothing more, just wait for it to hit. Now remember, the worst hasn’t even begun yet. The storm is coming, but isn’t yet upon us, and we had no idea of how bad it would get. I was one of the lucky ones. We survived. We moved out of Mississippi in December and moved to Pacific Grove. My family is alive and with me here. We all made it, and yet one of my twins has been having problems, nightmares, anger, etc. And then here I am, the rational one, I see the Navy do an awards ceremony, giving out all these “thanks you”, medals, and what all, to folks that supported the Katrina effort. But were NEVER there! I was so irrationally angry that I had to walk away. I couldn’t speak I was so pissed off. The only thing going through my head was “I didn’t see a single sorry ONE of you there! !” How DARE you!! I know this is nothing more than a stupid reaction. But I can’t stop myself. I know that over time things won’t be so sensitive. But right now I can’t help it. 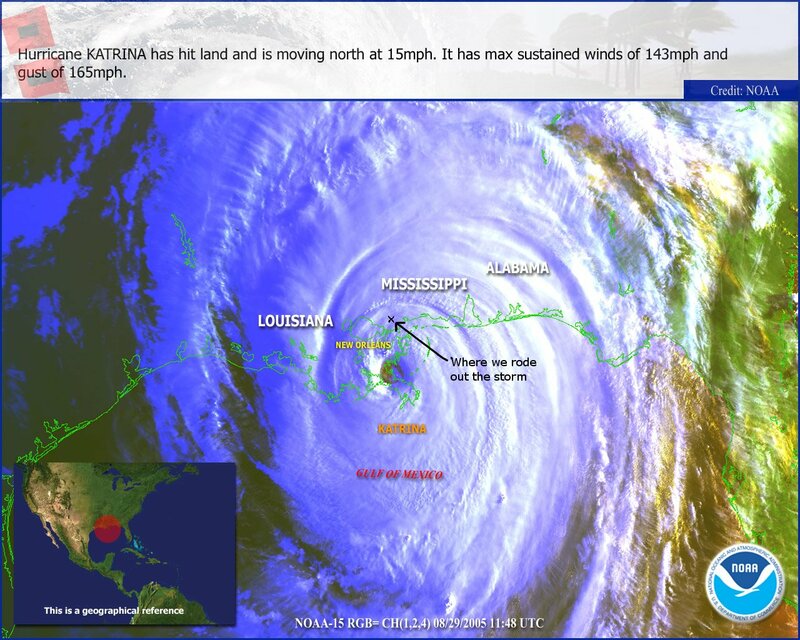 Katrina kicked a lot of us in the teeth. Some a lot worse than others. There are days that I’m amazed I even get out of bed. Everyday that goes by it gets a little more and more like a dream that happened to someone else.